Reply 'To Dr David Skene, Physician, Aberdeen'. 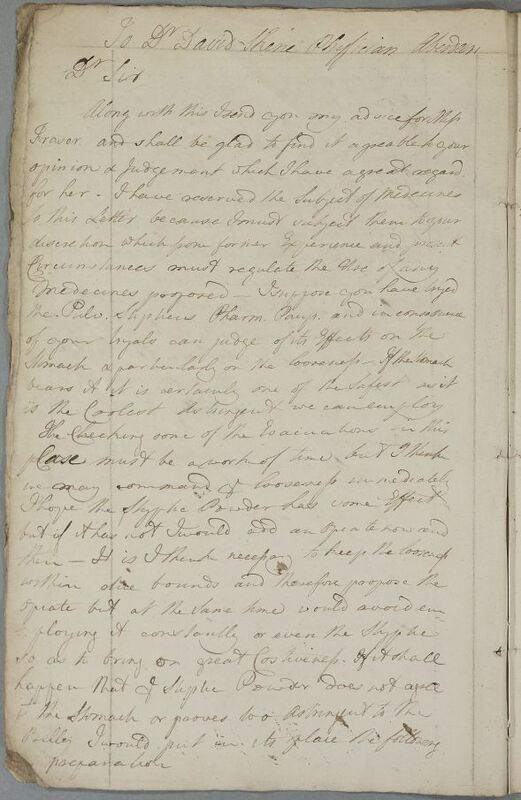 Contains advice for a Miss Fraser, and also mentions a Miss Grant. Summary Reply 'To Dr David Skene, Physician, Aberdeen'. Contains advice for a Miss Fraser, and also mentions a Miss Grant. 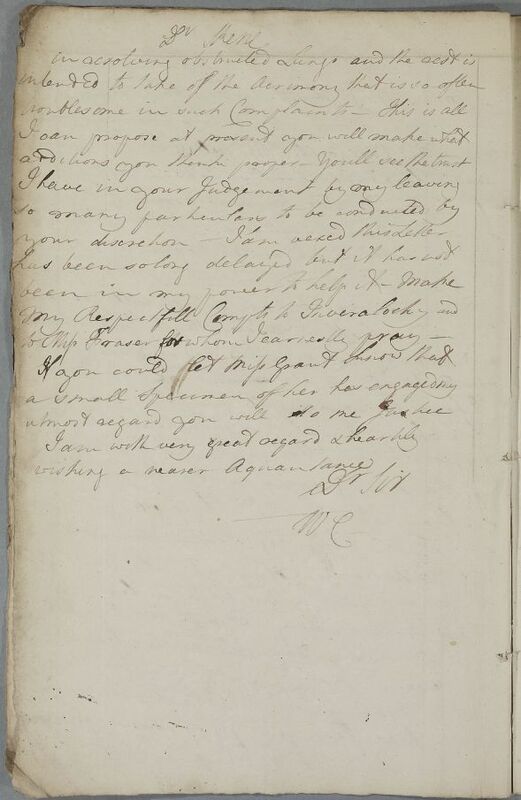 Case of Miss Fraser who is prescribed for 'looseness' (see also Case 1239). is the coolest astringent we can employ. we may command the looseness immediately. Take half an ounce of Peruvian bark, and a drachm apiece of Japanese earth and crushed pomegranate bark. Pour in a pint of boiled spring water, and steep for a period of two days, and then strain and here add two ounces of Peruvian bark tincture, and top with either two, three, or four blades of scurvy grass twice over three days, and then bear it to the stomach. be found to affect her breathing, Pulse or sweats. should be had to the Disorder (↑complaints↑) of her Breast. may take from ʒi to ʒii of this every day. utmost regard you will do me justice. 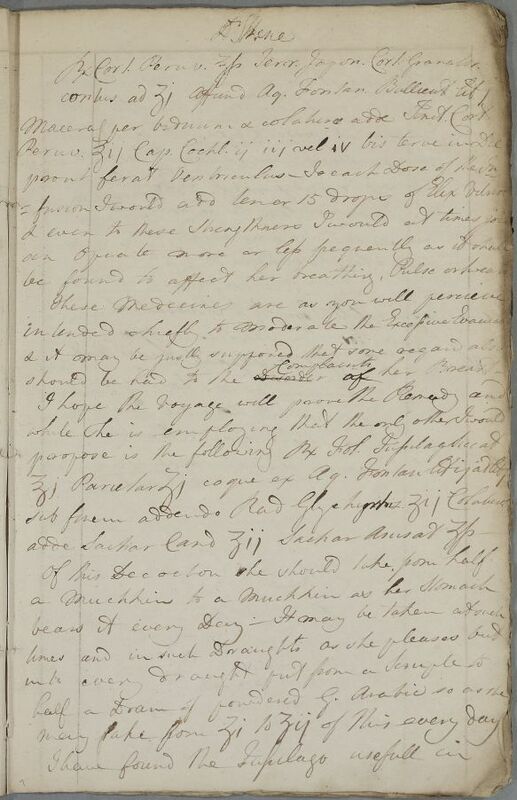 1: See Royal Infirmary of Edinburgh, Pharmacopoeia pauperum, in usum Nosocomii Regii Edinburgensis (Edinburgh: 1763), p. 32.
we may command ye looseness immediately.